Several people rushed to the scene of a violent crash to try to help the people trapped inside vehicles Friday. 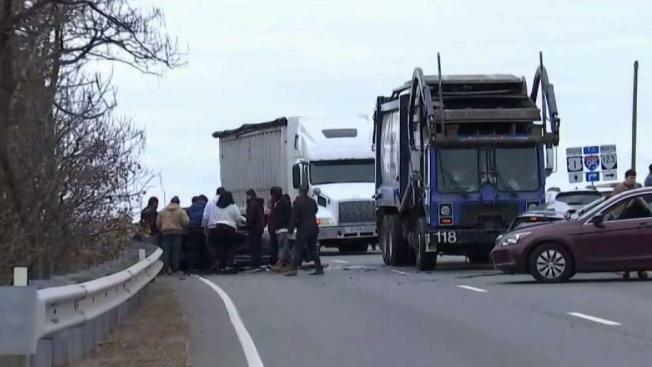 According to police, the driver of a BMW was headed northbound on Route 1 in Prince William County at a high rate of speed when it veered into the southbound lanes and crashed with a Ford Mustang. “I just heard a huge chunk, just a nice big hit,” said Roger Rojas, who heard the crash from his house about 100 yards away. He rushed to the scene to do whatever he could to help. Almost a half dozen good Samaritans tried to pry the passenger side doors of the BMW open while simultaneously keeping the two people inside calm. Meanwhile, Mohammad Abdulrazzaq focused on the driver of the Mustang. “When I saw the mustang car with an old lady in it, in the driver seat waiving with her left hand and screaming for help, so I just pulled over next to her and tried to help her exit her car, because it was actually smoking,” he said. When paramedics arrived, they had to cut the two victims out of the BMW. Three people were taken to the hospital with serious injuries, but they’re expected to be OK. The accident remains under investigation, and it is unknown whether anyone will be charged.